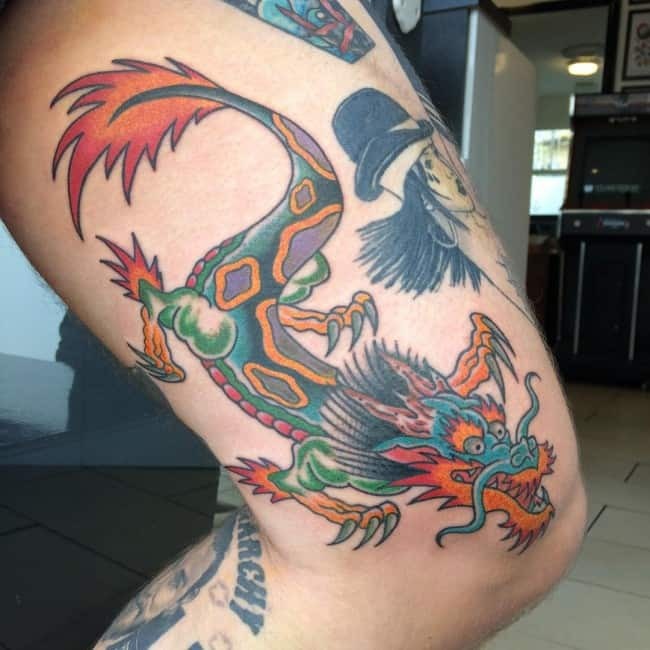 Dragons, the mythical creatures which breathe fire have always been a source of fascination for the human race and this is the very reason why these creatures have been used since times immemorial, in various art forms around the world. 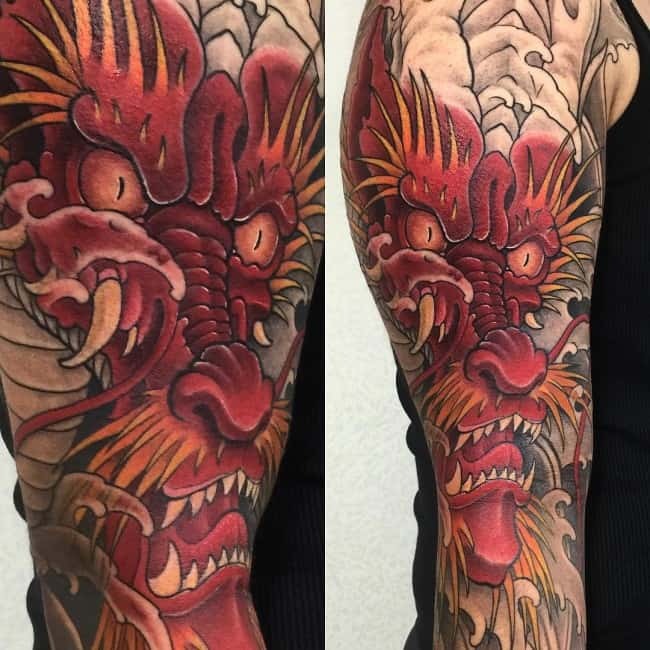 Tattoo art, too, is not untouched by the attraction of the creature and dragon tattoos are a popular design option in this art. 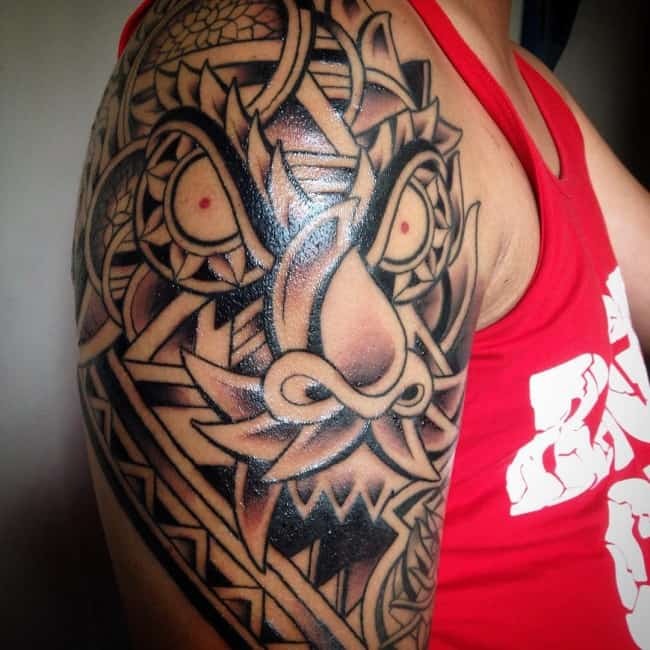 With this amazing element, the tattoo looks powerful and alluring and is sure to catch the eye of others, which is the very purpose of having a tattoo done by any person. They are extremely famous nowadays among tattoo lovers in the entire world, and you are aware of that for sure. These are considered to be among those animal tattoos that are worn by a lot of people, regardless of their sexual orientation. Well, there is no question about that since dragon is a mythical creature that is loved by many in the past years and even up to this day. 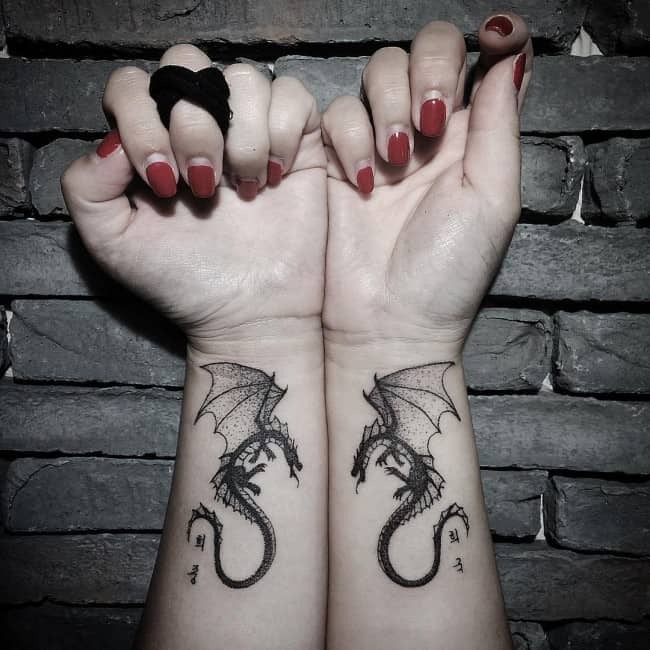 Despite the fact that no one can really say that they have seen dragons in their entire lives, there are still a lot of people who choose these tattoos to be engraved on their body. 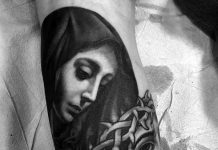 Without a doubt, you can be the center of attraction when you have these tattoos, fulfilling the number one reason of having tattoos. Strength – A dragon actually symbolizes strength, and this is all because of the fact that this creature is extremely powerful. Many people believe that it can destroy an entire city by using fire that it can release through its mouth. This is also the reason why it represents power and bravery. Balance in Life – Another thing that a dragon is the balance of life. This is what Japanese people believe in. As a matter of fact, a dragon is an integral part of Japanese Mythology. In this mythology, the dragon is known to be the water deity. The Japanese culture believes that a dragon has a camel head, carp scales, eagle claws, and tiger paws. Good Luck – The Chinese people have this belief that a dragon symbolizes good luck. In fact, dragon is a sacred symbol in the Chinese culture. It is also representing goodwill and wisdom to them. Evilness – Another thing that a dragon represents is evilness. This is according to the Western culture. Western people believe that this creature is feared by a lot of people, making it to be the epitome of evil. As a matter of fact, European folklore made dragons as evil creatures in a number of their tales. Angelina Jolie – This 41-year-old American actress and philanthropist looks even more gorgeous of her Chinese-style dragon art that is located on her left arm, particularly on the upper part. 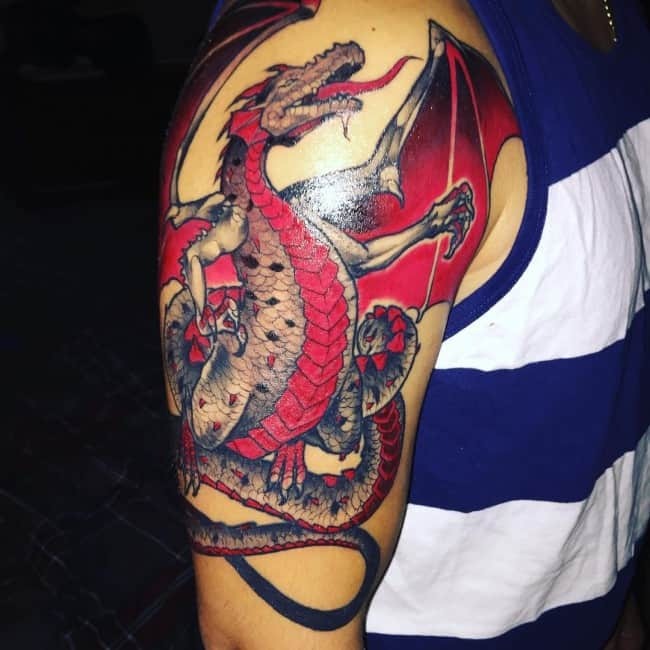 Karrueche Tran – This 28-year-old American model and actress is also a great fan of a dragon art. She has this very colorful art on her left arm that definitely enhances her gorgeous look. Pink – Pink is a very famous American singer nowadays, and he has a gorgeous dragon inked located on her left thigh. Debra Wilson – Debra Wilson is a 54-year-old American comedian and actress, and she’s is a big fan of tattoos. She has a dragon inked on her right thigh, along with tribal tattoos. 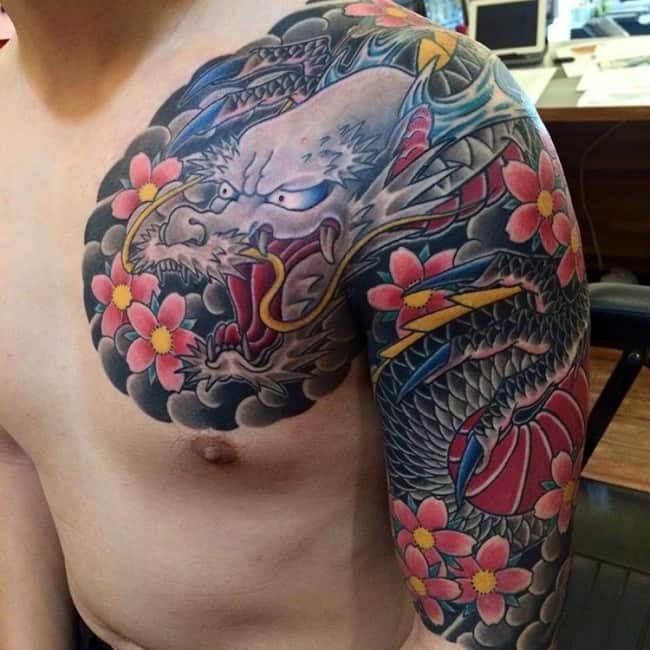 The most popular among design are the Chinese and Japanese tattoo dragon designs, which are generally borne on the chest area and look great as masculine tattoos. 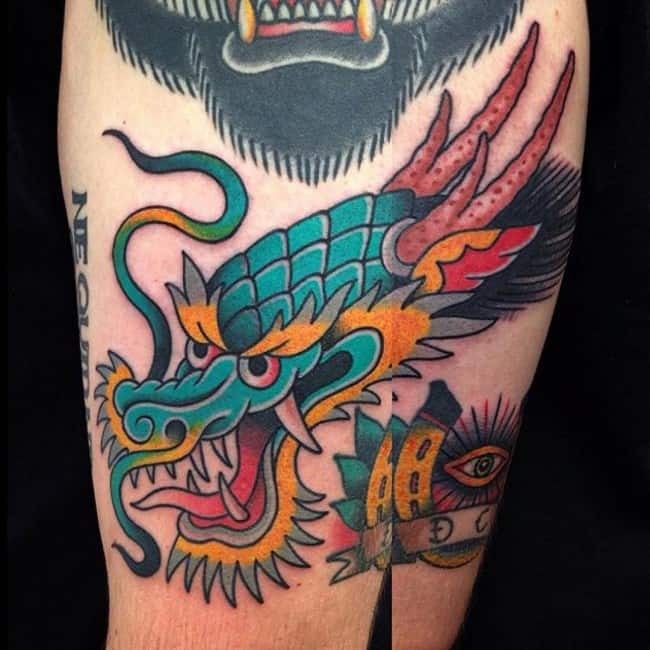 The tribal dragon art often feature dragons as large and fierce creatures, with a striking visual impact created by the use of bold lines and curves. 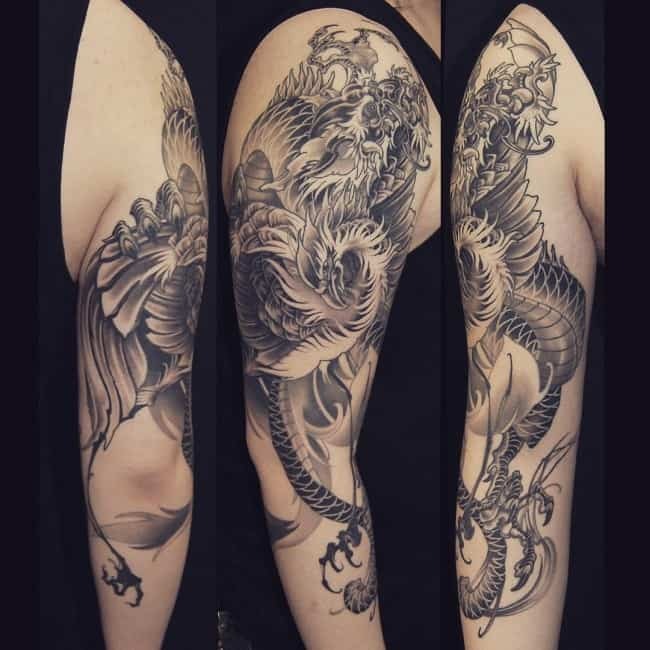 Masculine dragon art represent the brave and fierce side of the dragon and carry bold and manly design while softer lines and graceful curves are integral part of feminine designs; as such designs are meant to allure the onlooker with their stunning beauty. 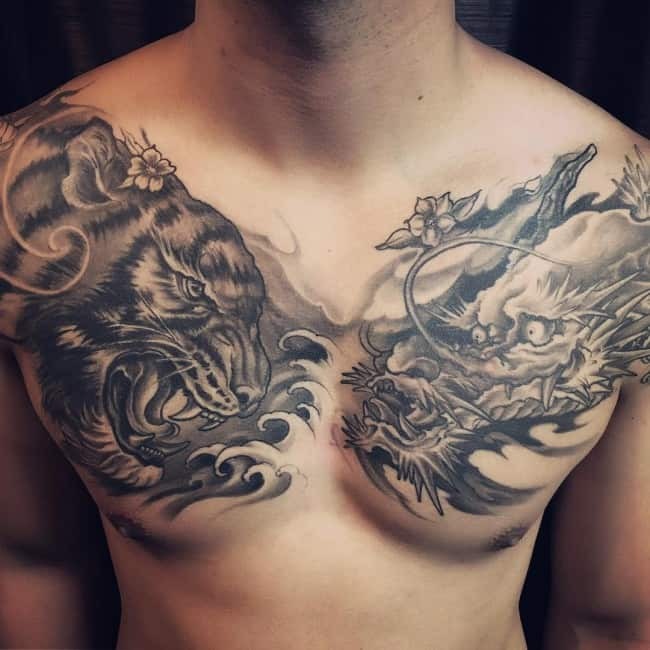 Girls can have smaller sized tattoos etched on their shoulders, arms, back of the neck and ankles, while men usually go for bigger, more powerful designs which cover a good part of their back or chest and can be flaunted by them. 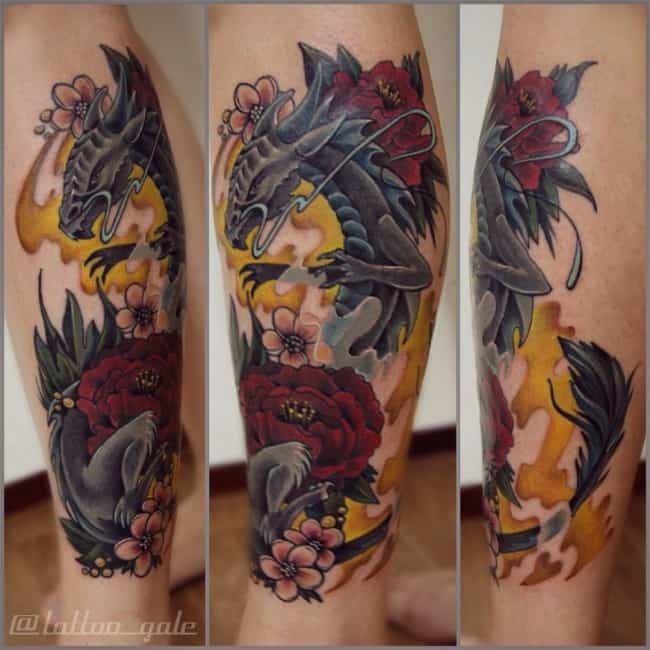 Some dragon art designs can incorporate other common tattoo elements such as the skull, flowers and birds, depending upon the choice of the user. The design can be discussed with a creative designer, who can create something unique as per the demand of his client. 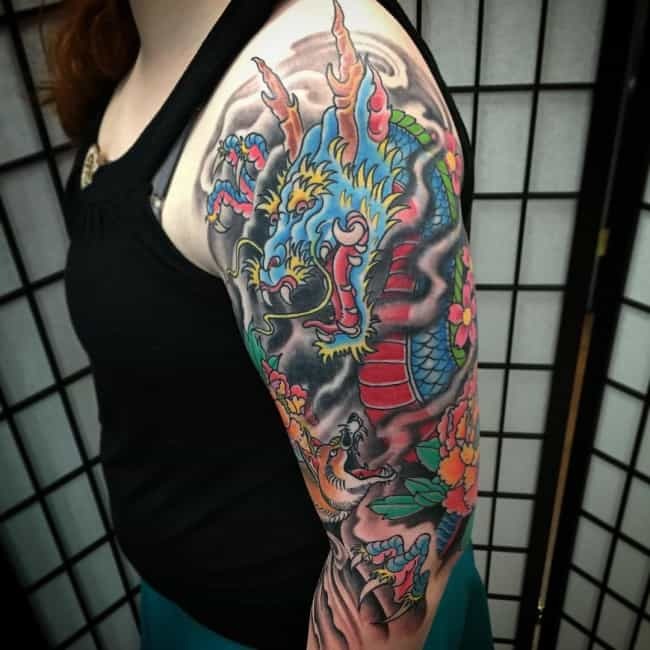 Dragon with fire is another popular option as it looks attractive and is bound to capture the attention of the onlooker with its vibrant color and bold design influence. Dragons are legendary creatures, which are associated with strength and power. The creature is huge and scaly and emits fire though its mouth. There is something about them, which associates them with beauty as well as fear. Different cultures around the world associate the creature with diverse meanings. 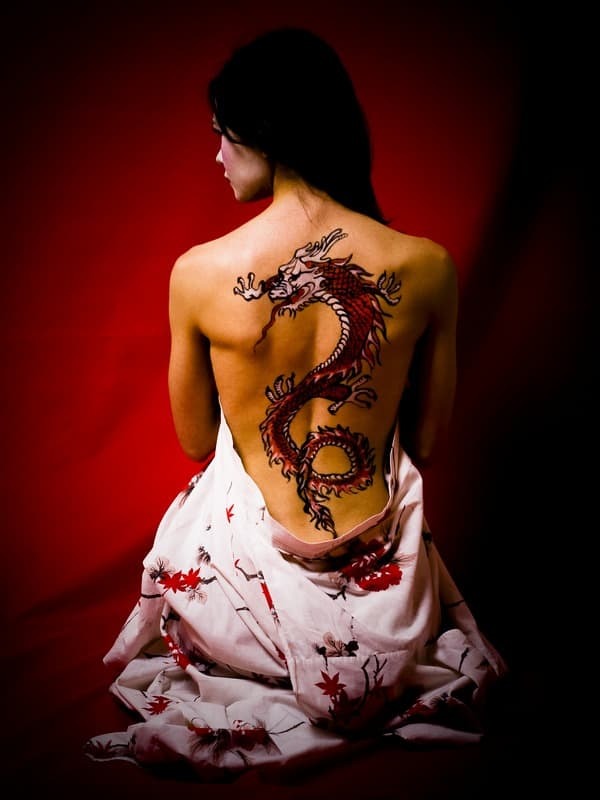 Dragon is a powerful creature, which associates the dragon tattoo with strength, bravery and power. 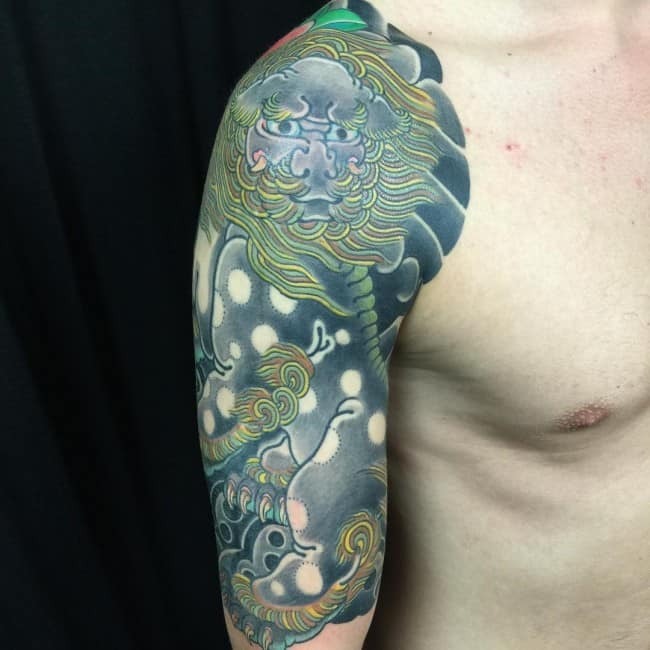 The dragon occupies a very important place in Japanese mythology, where it is regarded as the water deity. The culture views this majestic creature in a very different way, with the head of a camel, paws of a tiger, claws of an eagle and scales of a carp. 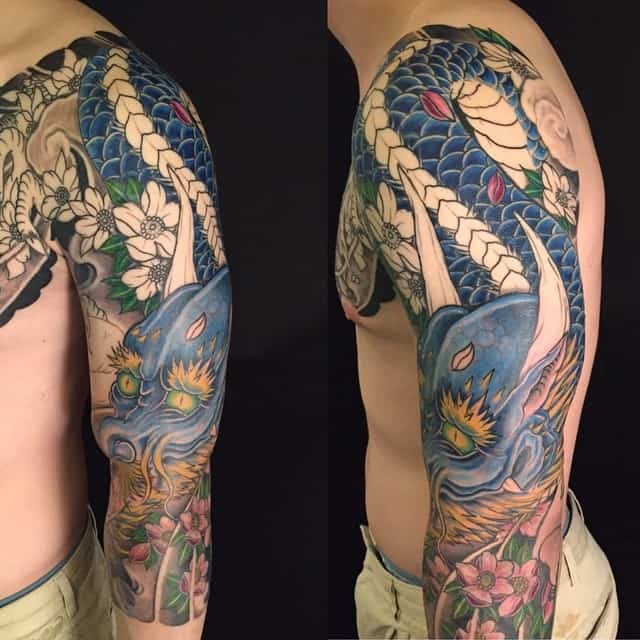 The Japanese dragon depicts the balance in life. The Chinese culture also regards this magnificent creature with great reverence. It represents power and incites fear in the enemies. Dragon harbingers luck, wisdom and goodwill in this culture. In both, Japanese and Chinese cultures, the creature is considered a benevolent one. On the other hand, the Western culture deems the dragon as an epitome and evil and the creature is feared in this culture. Dragons are seen as the evil creatures in most of the European folklore. In Germany, the creature is regarded as the symbol of greed and negativity, as it lives in dark and underground areas. The Roman culture treats is as mix of Asian and Western influences and the meaning varies from design to design. 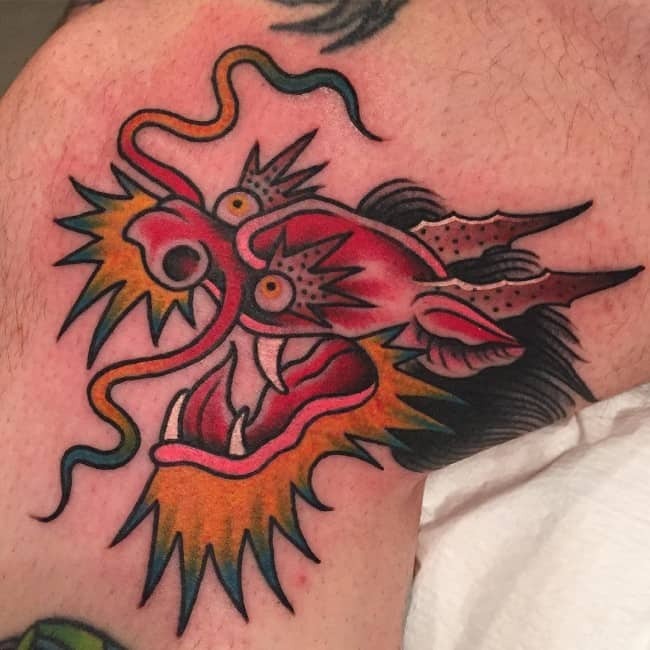 In most parts of the world, dragon art is loved as the creature makes a show of power and strength and attributes these traits to the bearer of the tattoo. Would you like to check our hand-picked collection of Lion Tattoos? They are usually large in size as the creature itself is majestic and huge. 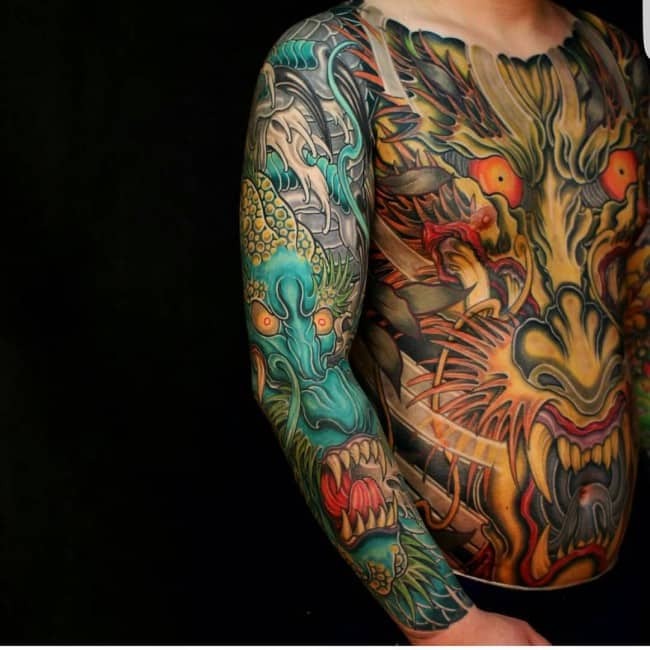 It is a well known fact that the size of the tattoo influences its placement on the human body, that is, larger the size, more is the surface required to depict it on the body of the bearer. Therefore, they are ideally featured on the back, side and chest, thighs and most of them cover a huge surface area, sometimes the hole of the body part. Smaller versions of the tattoo can be seen on the shoulder, wrist, ankle, finger, arm and neck. 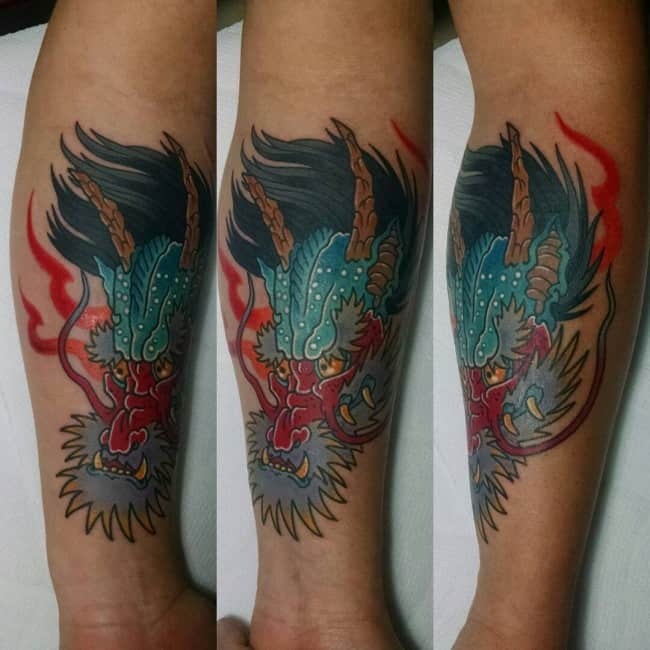 The dragon art design is equally popular among both the sexes, but it has to be done after a lot of consideration because the tattoo may be huge in size, which means one may have to spend a great deal of time and money on it. Additionally, such a big tattoo is hard to get rid of, if one wants so at a later stage. 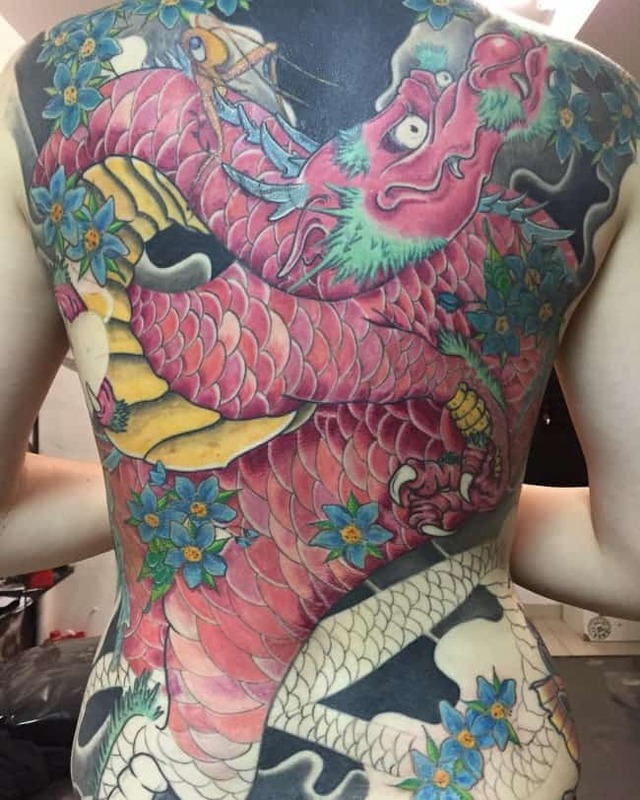 Though dragons have always mystified people and more and more of them are interested in this particular tattoo design, the popularity of the design has increased manifold because of global celebrities endorsing the same. 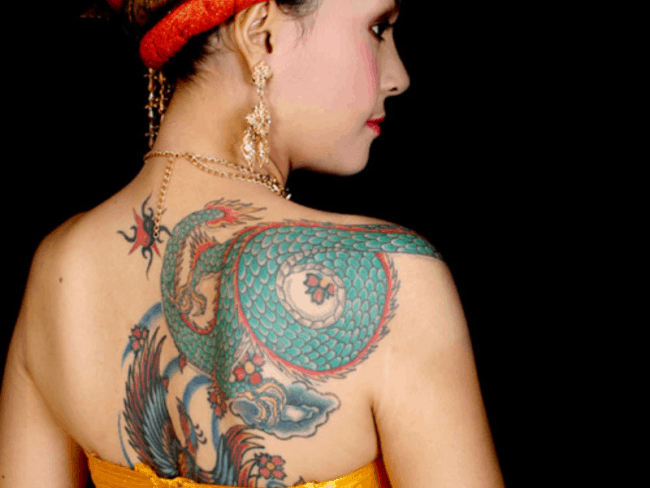 Some of the big names who have been spotted with dragon tattoos are Angelina Jolie, Bruce Willis, Mel B, Mel C, Pink, Howard Stern, Paula Yates, Lenny Kravitz and Jack Osbourne. The options in dragon art is actually endless and it is up to the bearer to choose the best one for oneself. 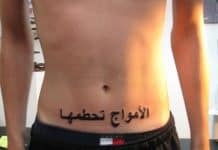 All he needs is the right attitude to carry this bold tattoo in a great way. 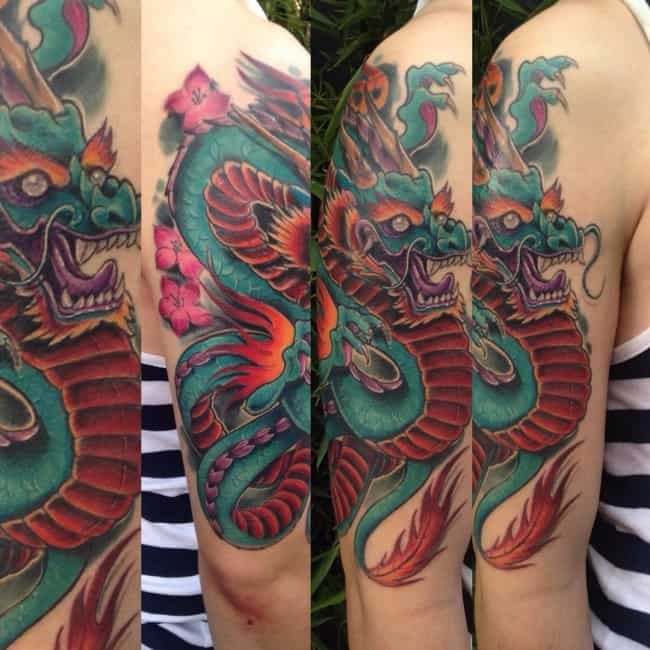 Dragon art tattoo has always been in trend and will continue to rule the hearts of millions around the world. Would you like to check our collection of Bird tattoos? Dragon Arton Back – You surely know that a dragon has an elongated body. Because of this, it requires a lot more spaces from your body as far as tattooing is concerned. This is the main reason why the common body placement of many people for this art is the back portion of their body. 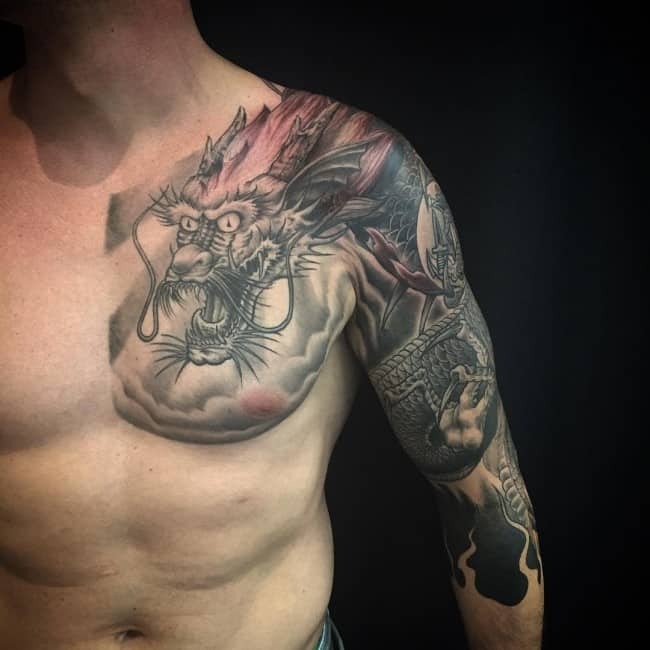 Dragon Art on Chest – Chest is another common body placement. This is very common to men since women have breasts that may affect the entire gorgeous illusion. 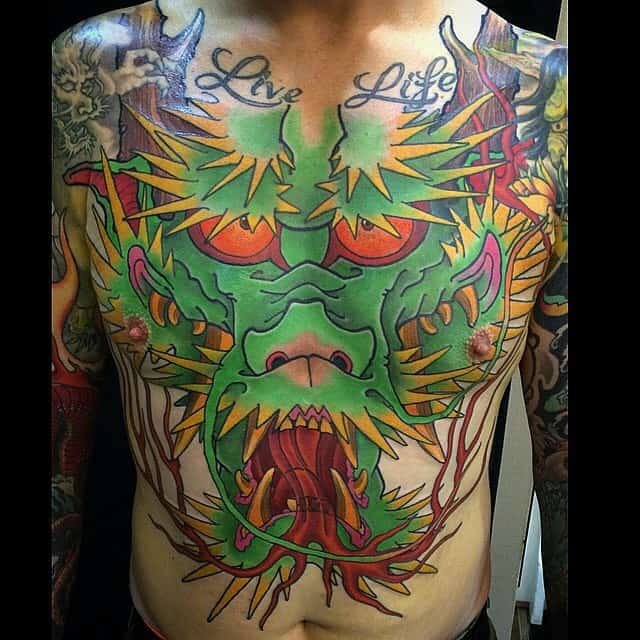 From the chest, you can extend the design to your stomach or to your shoulder. 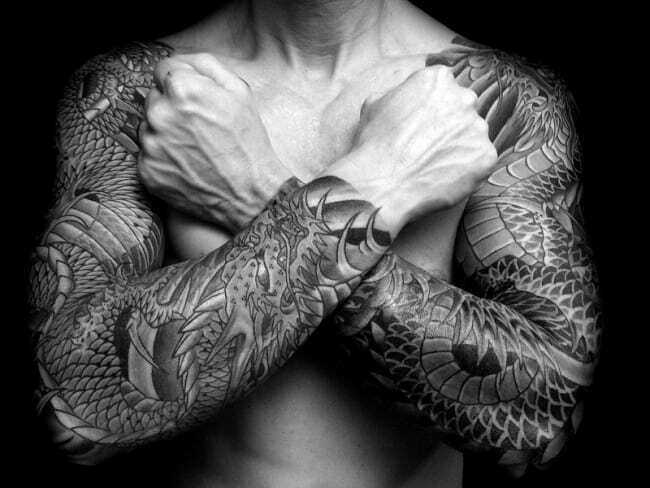 Dragon Art on Arms – They will also look great on your arms for sure. It is simply because human arms are naturally long, making it perfect for the elongated body of a dragon. You can decide where the tattoo would start. It is either right there on your shoulder or from your wrist. It is up for you to decide. 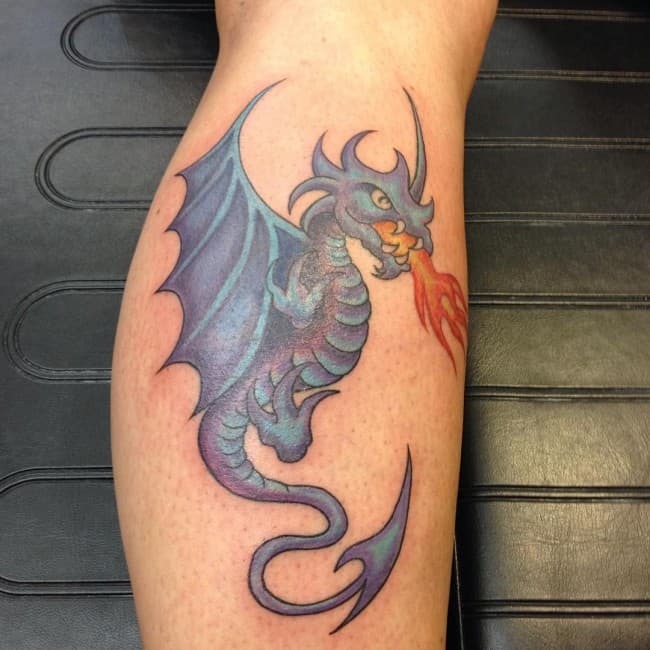 Dragon Art on Legs – Human legs are also long, so these can also be perfect locations. Of course, it is also your decision if you want to get tattooed both on your right and left legs or just one. To make the tattoo design more interesting, you can tell your professional tattoo artist to extend the tattoo towards your thigh part. 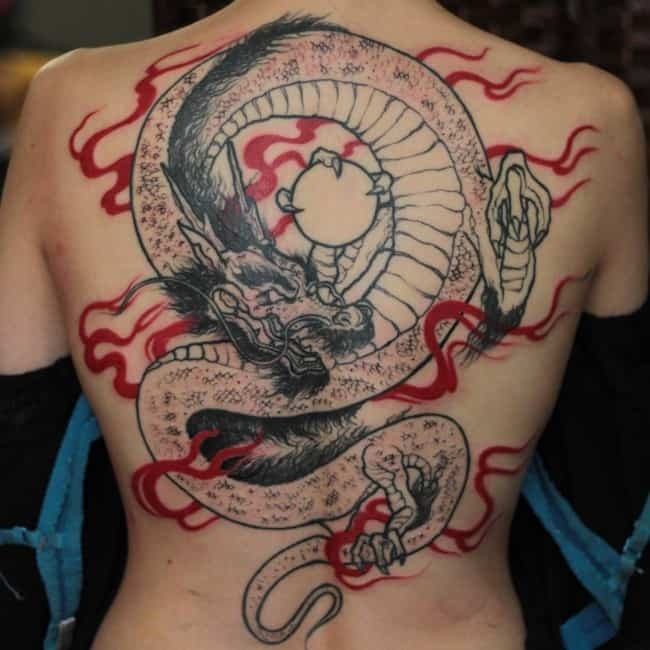 Dragon Art on Neck – If you want smaller design, it is actually possible. 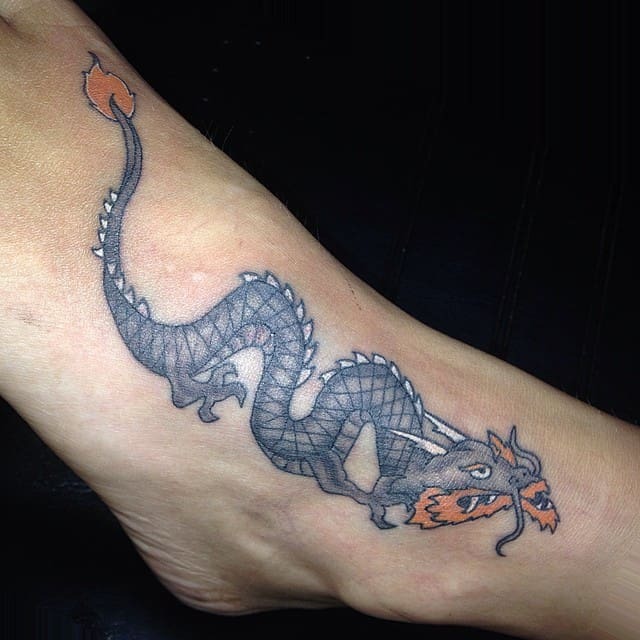 Even so, it needs great expertise from the tattoo artist since the details is very tiny, which need an expert hand. In this case, the neck area is the best body placement for the tattoo. 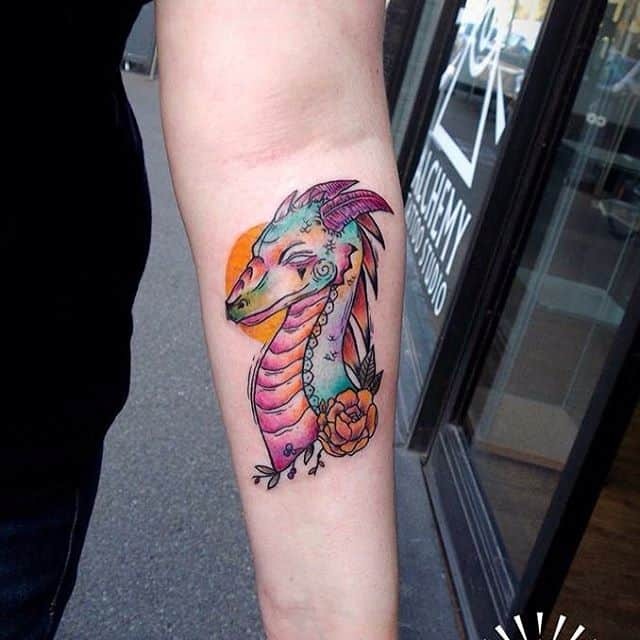 Dragon Art on Wrist – Your wrist can also be a perfect location for your smaller art. However, it will be a little bit painful for you since wrist is packed with minor and major nerves that connect to some other organs of yours. Hence, you must be brave enough to endure the pain. 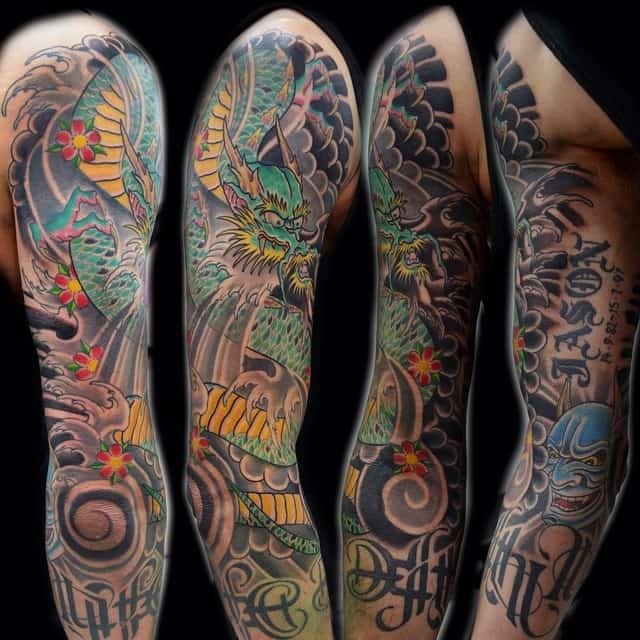 Dragon tattoos is undeniably very popular tattoo choices of many people in the world, including those famous celebrities. 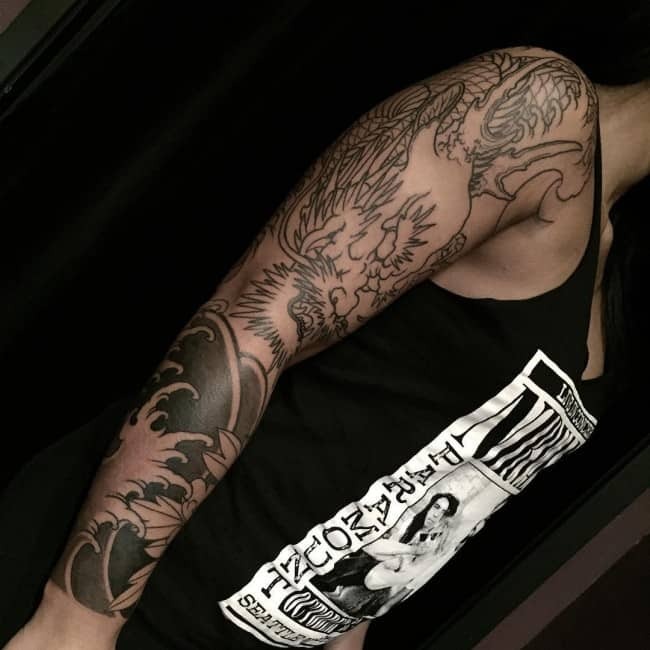 These are gorgeous body adornments that you can complement with some other tattoo designs in order for them to look even more beautiful to the eyes of many. 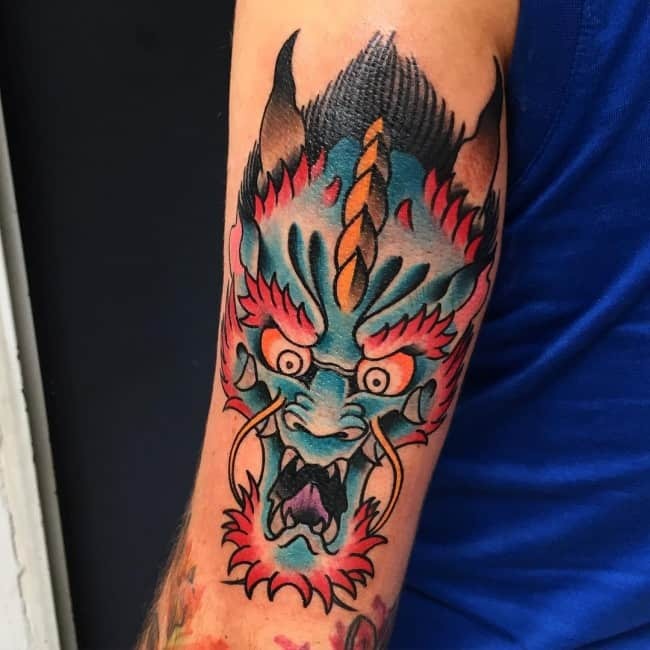 The dragon is a legendary creature, which stands for courage, strength and power in the Eastern culture and fear and evil in the Western world. 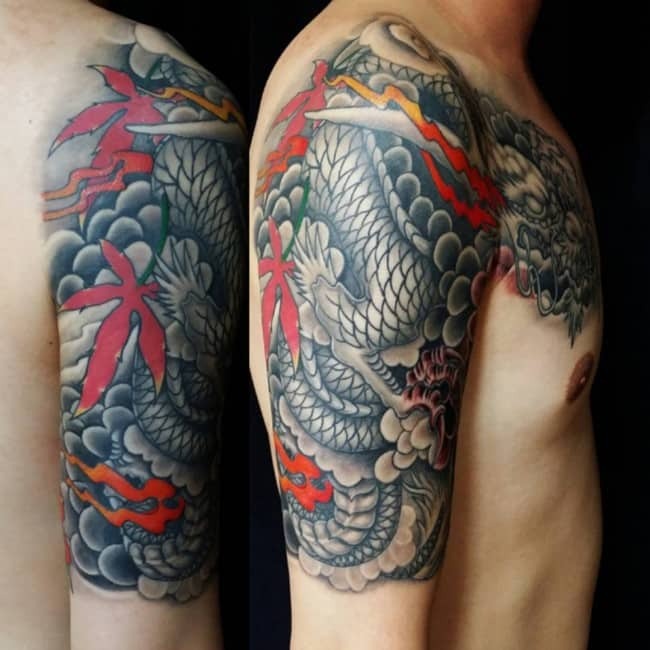 Besides its symbolic significance, the tattoo design has a wonderful aesthetic value, making it a much sought after tattoo design all over the world. Most of the dragon art designs are large and eye catching, which is the main reason of its popularity.